I'm an expat living in Berlin and I bought a StudioLive RM32Ai at a music store here in town. I see support is only available to US and Canadian customers, where can I go to get support? To obtain support for your product outside the USA, the first place you should go is back to the store where you bought your product. They should be able to assist you. If not, then please contact the PreSonus distributor in your country for assistance. Follow this link to look up the PreSonus Distributor for your country. 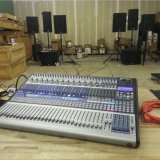 Where can I purchase dust covers, bags or rack ears for the Studio Live Mixers? Where does the cue mixes go out from my studio live 16.0.2 for different headphone mixes when recording? I'm in the UK and the only Studio 192 I can buy is the USA, when are they coming to the UK?